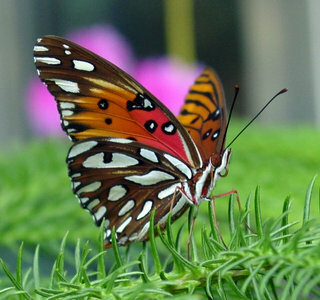 The Gulf fritillary, Agraulis vanillae, is a widespread, geographically variable neotropical species that occurs from the south central U. S. to southern South America. Lamas (2004) lists a second, undescribed species in the genus from Peru. Early stages: Eggs are yellow and approximately 1 x 0.8 mm (h x w). Females place eggs singly on leaves of the host plant. 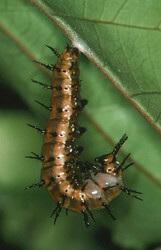 Mature larvae are approximately 1.2 cm long. Caterpillars are gregarious in small numbers (Brown, 1981). 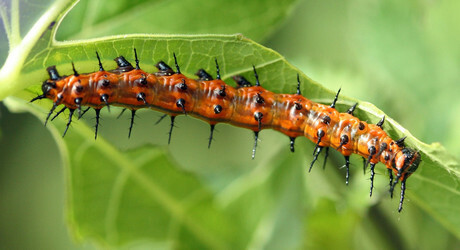 Agraulis vanillae larva. © David Cappaert. 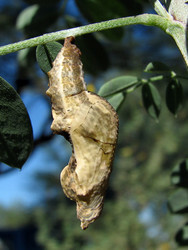 Agraulis vanillae larva getting ready to pupate (left, © Jerry A. Payne, USDA ARS), pupa (center, © Katja Schulz), freshly eclosed butterfly (right, © Jerry A. Payne, USDA ARS). Agraulis occurs in scrubs and fields. Usually individuals fly rapidly. Females mate multiply, and adults roost at night in loose groups, lower than 2 m above the ground in grass blades and leaves (Brown, 1981). Hostplant: Agraulis is polyphagous, and larvae feed primarily on plants from the subgenera Granadilla and Distephana (Passifloraceae) (Brown, 1981). Boisduval J. B., Dechauffour de A. and Le Conte J. E. 1835 Histoire générale et iconographie des lépidoptères et des chenilles de l'Amérique septentrionale. Paris, Méquignon-Marvis; Crochard; Roret. (11-22): 101-196, pls. 31-65. Michener CD. 1942. A review of the subspecies of Agraulis vanillae (Linnaeus). 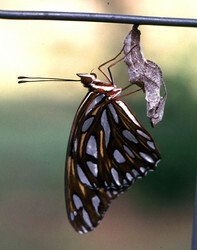 Lepidoptera: Nymphalidae. Amer. Mus. Novit. 1215: 1-7. Page: Tree of Life Agraulis Boisduval & LeConte 1835. Agraulis vanillae (Linnaeus 1758). 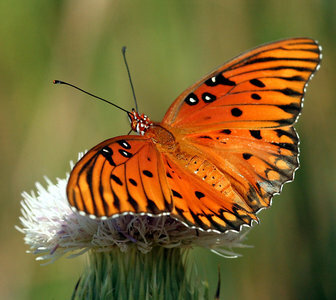 The Gulf Fritillary. Authored by Andrew V. Z. Brower and Margarita Beltrán. The TEXT of this page is licensed under the Creative Commons Attribution License - Version 3.0. Note that images and other media featured on this page are each governed by their own license, and they may or may not be available for reuse. Click on an image or a media link to access the media data window, which provides the relevant licensing information. For the general terms and conditions of ToL material reuse and redistribution, please see the Tree of Life Copyright Policies.